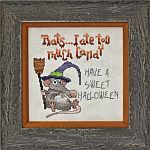 All Hallows Eve deisgned by Cheryl Granda of Glendon Place is stitched on 14/28 count Tarnish from Picture This Plus with a stitch count of 178w x 298h and uses Sullivan threads with DMC and Anchor conversions. 5 Mill Hill Star buttons are available, or may be stitched. Baked Alaska, part of the A-Maze-ing Desserts Collection from Glendon Place is stitched on 14/28ct Aerial from Picture This Plus with a stitch count of 196w x 198h. 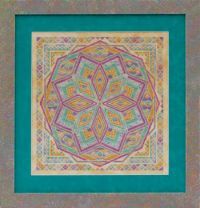 This pattern uses 6 colors of Dinky Dyes hand-dyed silk, 1 Sullivan cotton floss and 4 colors of Mill Hill Beads. A silk pack is available for $52.00. Castle Le Creep from Glendon Place is stitched on 14/28 count Raven hand-dyed fabric from Crossed Wing Collection with a stitch count of 171w x 211h using Weeks Dye Works, Caron Waterlilies, Kreinik #4 Metallic Braid and Sullivan thread with DMC/Anchor alternative. 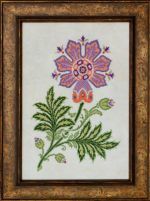 Come Said The Wind from Glendon Place Designs is stitched on 28 count Cyprium hand-dyed fabric from Picture This Plus with a stitch count of 257w x 257h using 3 colors of Caron Waterlilies. Conversions to Weeks Dye Works, Gentle Art Sampler fibers and Crescent Colours are available. 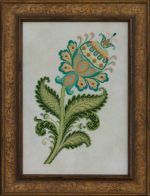 This design requires stitching on a linen or evenweave fabric as the poem itself is stitched over one thread. Come Sit A Spell from Glendon Place is stitched on 14/28 Antique Blue with a stitch count of 180w x 165h. 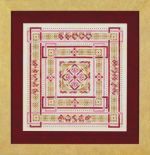 This pattern uses Sullivan floss with Anchor and DMC alternatives and one Caron Collection silk thread. A button pack is available from Just Another Button Company. 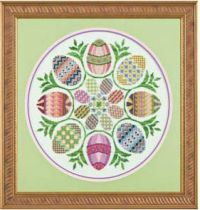 Eggs Ala Round from Glendon Place is stitched on 28ct Chrysalis Cashel Linen from Picture This Plus or a comparable fabric may be used. The stitch count is 190w x 190h using 1 Sampler Thread, 45 Sullivan threads, 9 Kreinik #4 Very Fine Braids and 11 Mill Hill Beads. 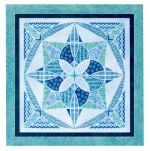 Flakes from Glendon Place is stitched on 14/28ct White Opalescent with a stitch count of 78w x 242h using 4 Dinky Dyes silk floss, Sullivan floss, 4 different Mill Hill Treasures. A DMC/Anchor conversion is available for the Sullivan floss. 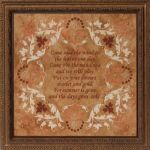 Glendon Place Floating Leaves is stitched on 14ct Aida or 28ct Natural Linen with a stitch count of 98w x 68h. Metallic Brown Kreinik braid is used with DMC or Anchor and Mill Hill Beads. Frank's Family Portrait deisgned by Cheryl Granda of Glendon Place is stitched on 14/28 count Mire from Picture This Plus with a stitch count of 120w x 160h and uses Sullivan threads with DMC and Anchor conversions. I Waterlilie silk fiber is used. Included with the pattern are the silver-plated pewter charms and Kreinik for the Bride of Frankensteins necklace and earrings. Fudgy Mint Mousse from Glendon Place, another of Cheryl's Amazing Desserts is stitched on 14/28count Fog from Picture This Plus with a stitch count of 198w x 196h and uses 6 colors of Dinky Dyes, 4 colors of Mill Hill beads and one Sullivan floss with DMC alternative for the floss. 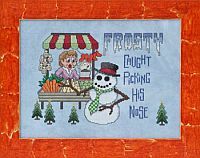 Gentleman Frost by Glendon Place is stitched on 14ct or 28ct Snow Squall by Crossed Wing Collection with a stitch count of 90w x 162h. This pattern uses 15 DMC/Anchor threads, 6 colors of Kreinik Metallic Braid and 5 Mill Hill Bead colors. 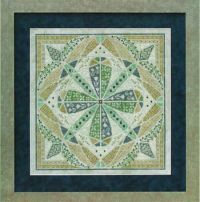 Glendon Place Ghool School is stitched on 14ct Aida or 28ct Cauldron by Picture This Plus with a stitch count of 160w x 150h DMC floss, one Waterlilies and a Just Another Button Pack is available. 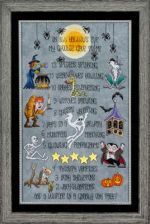 Glendon Place Ghostly Gathering is stitched on 14ct Aida or 28ct Galaxy by Crossed Wing Collection but also looks great on Monet by Picture This Plus Hand-dyed fabric with a stitch count of 240w x 109h. 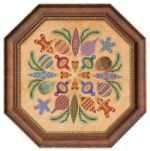 Glendon Place Give Thanks is stitched on 14ct Aida or 28ct Earthen by Picture This Plus with a stitch count of 219w x 190h. DMC or Anchor floss is used with 3 Caron Waterlilies, Mill Hill beads and Crystal Treasures. Grasshopper Pie from Glendon Place is one of a series of A-Maze-Ing Desserts. It is stitched on 14ct or 28ct Pampas hand-dyed fabric from Picture This Plus. The stitch count is 192w x 192h, utilizing 6 Dinkey Dye silk threads, 1 Sullivan (with DMC/Anchor conversion) and 4 Mill Hill Beads. A silk thread pack is available for $48.00. 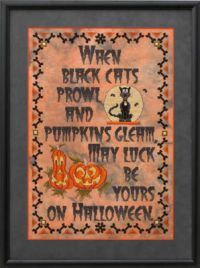 Halloween Luck from Glendon Place is stitched on 14/28count Eek from Picture This Plus with a stitch count of 171w x 250h. This pattern uses Sullivan floss with Anchor and DMC alternatives. An accessory pack containing the Dindy Dyes Silk Floss, Kreinik #4 Braid, 3 Mill Hill Black Bat Treasures and 1 Sterling Silver 4-Leaf Clover Charm is available for $29.00. 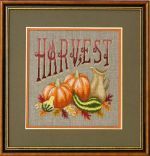 Glendon Place Harvest Gourds is stitched on 14ct Aida or 28ct Natural with a stitch count of 117w x 117h. Kreinik metallic gold braid is used with DMC or Anchor floss. Isabel by Cheryl Granda, Glendon Place is the first in the Baroque Beauties Collection. The design is stitched on 14/28 count Tycho from Picture This Plus with a stitch count of 140w x 198h using Sullivan Floss, Kreinik #4 Very Fine Braid, Mill Hill Beads and Mill Hill Treasures for added bling! DMC and Anchor alternatives are provided. Katherine by Cheryl Granda, Glendon Place is the first in the Baroque Beauties Collection. 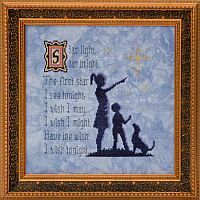 The design is stitched on 14/28 count Tycho from Picture This Plus with a stitch count of 134w x 198h using Sullivan Floss, Kreinik #4 Very Fine Braid, Mill Hill Beads and Mill Hill Treasures for added bling! DMC and Anchor alternatives are provided. 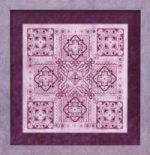 Madam Snow by Glendon Place is stitched on 14ct or 28ct Snow Squall by Crossed Wing Collection with a stitch count of 89w x 148h. This pattern uses 21 DMC/Anchor threads, 6 colors of Kreinik Metallic Braid and 6 Mill Hill Bead colors. Millicent by Cheryl Granda, Glendon Place is the first in the Baroque Beauties Collection. 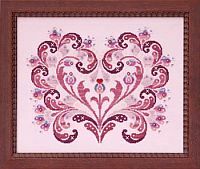 The design is stitched on 14/28 count Tycho from Picture This Plus with a stitch count of 129w x 205h using Sullivan Floss, Kreinik #4 Very Fine Braid, Mill Hill Beads and Mill Hill Treasures for added bling! DMC and Anchor alternatives are provided. 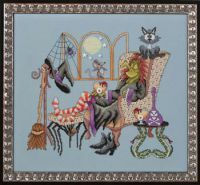 Glendon Place Monster March is stitched on 14ct Aida or 28ct Echo or Voodoo by Picture This Plus with a stitch count of 323w x 110h. DMC or Anchor floss is used in both versions of this pattern. Mr. Bone Janges by Glendon Place is stitched on 14ct or 28ct Red Wing by Crossed Wing Collection with a stitch count of 130w x 210h. This pattern uses 10 DMC/Anchor threads, the Kreinik Metallic Braid and one Mill Hill Treasure are included with the pattern. 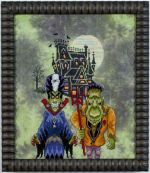 Glendon Place Murky Manor is stitched on 14ct Aida or 28ct Dawn by Picture This Plus with a stitch count of 190w x 190h. DMC or Anchor floss is used along with Caron Wildflowers, Kreinik Metallic braids and Mill Hill Beads. An embellishment pack of buttons is available from Just Another Button Company. Noel from Glendon Place is stitched on 14 count or 28 count Crystal Jade from Picture This Plus with a stitch count of 200w x 100h and uses 2 Caron Waterlilies, 2 Kreinik Metallic Braids, Sullivan, DMC or Anchor floss. Ornaments Ala Round from Glendon Place is stitched on 14/28ct Chrystal Relic from Picture This Plus with a stitch count of 191w x 191h using Sullivan floss, 10 #4 Kreinik Very Fine Braid, 12 Mill Hill Beads and 1 Mill Hill Treasure. A DMC/Anchor conversion is provided. Glendon Place Outrageous Owls is stitched on 14ct Aida or 28ct Blue Wisper Vintage with a stitch count of 20ow x 60h and DMC or Anchor floss is used. 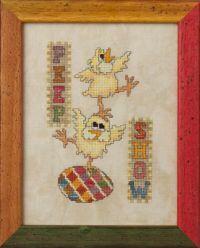 Peep Show from Glendon Place is stitched on 14/28ct Mello from Picture This Plus or a comparable fabric of choice. The stitch count is 66w x 98h and uses Gentle Art, Weeks Dye Works and Crescent Colours. 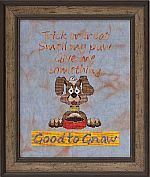 Pixie Stix, a limited edition chart from Cheryl Granda, Glendon Place in celebration of the 15- Year Anniversary of Brick City Cross Stitch. 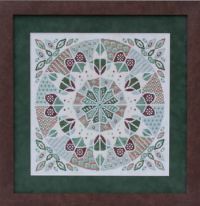 The pattern is stitched on 14/28 count Willow from Picture This Plus with a stitch count of 79w x 79h. 5 dinky- Dyes silk floss are used and 3 Mill Hill Beads. 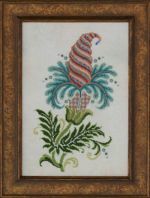 2 color versions,the one shown and a pink/pale turquoise version stitched on 14/28 count Fresco from Picture this Plus is provided on the chart. Plum Pudding from Glendon Place is one of a series of A-Maze-Ing Desserts. 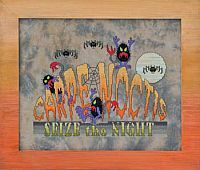 It is stitched on 14ct or 28ct Sprite hand-dyed fabric from Picture This Plus. The stitch count is 192w x 192h, utilizing 6 Dinkey Dye silk threads, 1 Sullivan (with DMC/Anchor conversion) and 4 Mill Hill Beads. A silk thread pack is available for $48.00. Pretty Pumpkins from Glendon Place is stitched on 32 count Willow Green, alternative fabrics are Waterlily or Summer Khaki with a stitch count of 240w x 160h using DMC or Anchor floss. Pumpkin Swirl part of the A-Maze-ing Desserts collection from Glendon Place is stitched on14/28ct Sand from Picture This Plus hand-dyed fabric with a stitch count of 195w x 195h using 6 colors of Dinky Dyes silk and 4 Mill Hill Beads, 1 floss color is used. Rainbow Parfait from Glendon Place is another of Cheryl's Amazing Desserts stitched on 14/28ct Mello from Picture This Plus with a stitch count of 198w x 198h using 6 colors of Dinky Dye silk threads, 5 colors of Mill Hill beads and one Sullivan floss with a DMC alternative for the Sullivan floss. 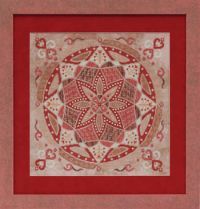 Red Velvet Cake from Glendon Place is stitched on 14/28 count Opal From Picture This Plus with a stitch count of198w x 198h using 6 colors of Dinky Dyes hand-dyed silk, 4 colors of Mill Hill beads and 1 Sullivan floss. 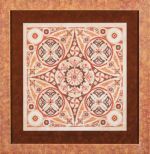 Reindeer Games by Glendon Place is stitched on 16ct or 32ct Natural with a stitch count of 156w x 322h. It is done using DMC or Anchor with Kreinik Metallic Braid, Mill Hill Beads and Treasures. 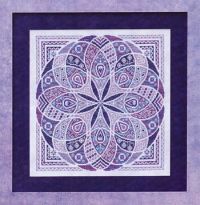 Included with the pattern is a bellpull option on 27count Penny banding. 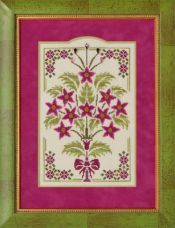 Royal Poinsettias from Glendon Place is stitched on 32ct Limestone from Zweigart or a fabric of your choice with a stitch count of 101w x 150h using Sullivan floss, 1 Crescent Colour, Belle Soie silk fiber, 1 Mill Hill bead and 3 different Mill Hill Treasures. A DMC/Anchor conversion is available for the Sullivan floss. Glendon Place Sixteen Gobbles stitched on 14ct or 28ct Natural Linen with a stitch count of 97w x 64h. You have the choice of Weeks Dye Works or Sampler Threads and 2 Kreink metallic braids. 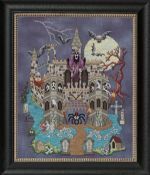 Sleepy Hollow by Glendon Place is stitched on 14 count or 28 count Haunted by Picture This Plus with a stitch count of 170 x 250. It uses DMC, Kreinik, Caron Waterlilies and Mill Hill Beads. 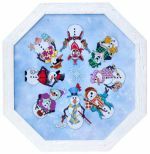 Snowmen Ala Round from Glendon Place is stitched on 14/28ct Snow Squall hand-dyed fabric from Crossed Wing Collection with a stitch count of 200w x 200h using Sullivan Floss with DMC/Anchor conversion. 10 colors of Kreinik #4 Metallic Braid are used and 3 colors of Mill Hill beads. Strawberry Shortcake part of the A-Mazeing Desserts Collection from Glendon Place is stitched on 14/28ct Chime from Picture This Plus hand-dyed fabric with a stitch count of 197w x 197h using 6 colors of Dinky Dyes silk, 4 Mill Hill beads and 1 floss. 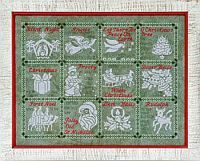 The Spirit of Christmas from Glendon Place is stitched on 16/32ct Jade from Picture This Plus with a stitch count of 278w x 204h using Dinky Dyes silk floss,1 Mill Hill Bead and 1 Mill Hill Treasure.